Yesterday was my fifth non-dog training. Just by coincidence I’ve been able to make consecutive trainings. I have one more non-dog training session – it will most likely be in two weeks since I’ll miss next Saturday’s outing. I’ll instead be going to herding and agility class. Today we all met up at Hatcher Pass, where it was snowing—lightly at first then increasingly more heavy. It’s like a whole different world up there – it feels like one is really in the wilderness. It was also the day in which the area was opened for the first time to snowmobiles, so there was a lot of machinery traffic. These weren’t the regular recreational vehicles that you see around our area, but rather, the noisy beefed up kind of machines that move fast and smell really bad. front of all those really competent people. But I somehow got the snowshoes on. And they stayed on. Stacey determined that there wasn’t quite enough snow where we were digging, so we three retreated back downhill, to the parking lot, and again began digging into the parking lot berms. After a bit there was one marginal cave, and a handful of other caves for the dogs to check out. Stacey then told me to head back uphill and be a subject. In other words, I was to crawl into a cave and be rescued by a dog and its handler. I did as told. 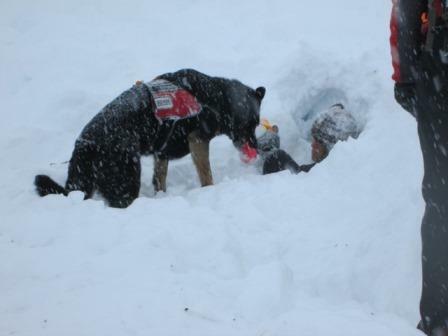 I crawled into a cave – proper protocol was observed – I had a radio and an avalanche beacon strapped to my person. And I had a support person. Aaron’s job was in part to ask me if I was doing okay, to which I was to reply aye or nay. Beforehand, I was asked if I was claustrophobic, to which I said I didn’t know. Truth is, I am. I don’t like the thought of a lot of rock or snow above my head. But I said what I said because I figured that if I said that I was claustrophobic, that I might freak out. As it turned out, the space I was in was non-claustrophobic. I had plenty of room, and light came through the cracks by the opening. And the light shone through the snow on the sides – it was a clear blue in color. I was in the snow cave for twelve minutes. I heard via the radio that there was some concern about this – this also made me feel more at ease. Shortly thereafter I heard snuffling, saw two paws and a snout. It was Bettles the German shepherd. He began digging. And his owner Vicki began shoveling. Vicki then handed me a tug toy – a rubber ball on a rope – I was told to hang on – and Bettles was told to pull me out. I was rather blown away by how strong Bettles was. I assisted her in wiggling my way out. Then I continued to play with her because as I have now figured out, this is the dog’s reward for having found the subject. Afterwards, I again got in the cave and again was rescued. This time, Donna and her German Shepherd Kip did the honors. It was déjà vu all over again. I again heard snuffling, saw paws, and a snout. And as did Vicki and Bettles, Donna shoveled and Kip dug. Donna too gave me a Kip’s tug toy. Kip wasn’t as strong or as forceful as Bettles, but she too knew what her job was, and how to do it. Afterwards, I again got in the cave and again was rescued. There was by now a bit less room in the cave because snow had fallen into it. This time, Stacy B and her black lab Jake did the honors. I again heard snuffling, saw paws, and a snout. This time the paws were black and the snout was black with white on it. The white – Jake is 11 years old. Seeing’s Jake’s happy grin, I couldn’t help but wonder if someone who was being rescued might be a bit unnerved by the sight of a large German Shepherd. Once upright, this subject realized that she’d gotten lucky in two ways. The first was that I was rescued by dogs who knew what they were doing. None (for example) tried to dig down from the top of the heap. If any had done this, the cave roof might have collapsed on top of me. Next up was Jim’s dog Yukon, a herding dog mix. I volunteered to go in again, but Stacy B. suggested that I instead watch the next rescue. Stacy has done a lot of this kind of work – in fact, she’s a nationally known expert. I later realized that right at that moment in time that Stacy knew something that I did not – this was that I was wet and cold, and that going into the cave a fourth time would do me more harm than good. So I instead helped pack the entrance of another cave, this after Cathy climbed in. This was the most interesting thing of all – the rescue part of search and rescue is far more complicated than one might imagine. 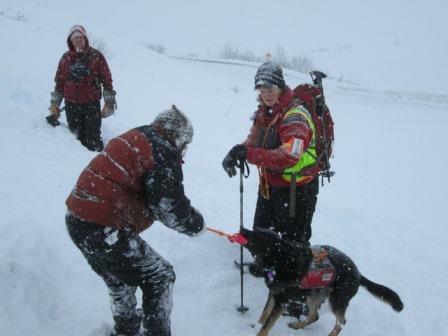 As the dog has to be trained to search, it also must be trained to rescue. Stacy B noted to Jim--Yukon’s owner--that Yukon was doing his job when he “rescued” Cathy, but noted that the dog’s gaze went back-and-forth between Cathy and Jim. She who knows about such things said to Jim that when doing a rescue, that the dog needs to be focused on the work at hand, not on the owner. Furthermore, this, what I’d call the rescue drive, needs to encouraged. I then asked Stacy B. about this, using Ryder as an example, prefacing my remarks by saying that there is a fine line between bonding with a dog and encouraging its independence. I then mentioned to her that we’ve been taking her out on the trails daily, and letting her run around. Stacy B. said that this is a wonderful thing to do, adding that dogs need time to be dogs, that is to run around and smell things and just enjoy being outside. I was really glad to hear this, for it means that Pete and I are really doing right by her. At the same time, we’re increasing the odds that she’ll be a good search and rescue dog. Nope, this day could not have gone any better than it did. I pushed on the door and it swung open a bit further. How good is that?